Audio Deals: Get Up to 60% Off Soundfreaq, AIAIAI, BT Earbuds + More! We ordered these deals from cheapest to most expensive. Enjoy! For the more physically active listener, these headphones might work better. The Active Wrap 'phones are wireless and have noise-cancelling technology, but they are designed to stay attached even if you have the most violent running style imaginable. Plus, they have the whole microphone-and-remote thing, too. The background hum of a city is not the sweetest musical accompaniment, so these noise-cancelling buds are great if you have to commute. They're also wireless and super lightweight, plus they have a remote and a microphone, so you can keep your phone safely pocketed. If you prefer to hear music in the open air, the RAW is a good option. 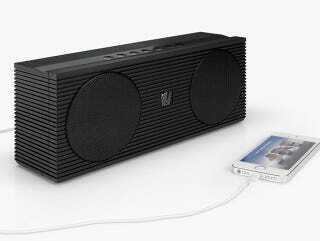 It offers nice sound quality, decent power, and a waterproof/dustproof/shockproof/scratch resistant exterior. In other words, a tough cookie. There's no place like the shower for belting out a power ballad without social repercussions, so you might as well have a decent backing track. This shower speaker is splash proof (as you might hope), wireless, and equipped with a microphone, so you can talk to Siri…in the shower. Soundfreaq is primarily known for two things — BIG sound and great integrations with mobile devices. Both attributes apply to the Double Spot, which can charge USB devices and has its own EQ for cooler or warmer audio. Plus, it has a six-hour internal battery, and a very nice exterior, methinks. And finally, something a bit special. The TMA-1 'phones not only look the part, but they also back it up with superb sound quality, thanks to 40mm closed titanium drivers. No wonder, given that the likes of James Murphy, A-Trak, Seth Troxler and Madlib worked on their design. Plus, they offer good cushioning, and interchangeable earcups, so comfort is definitely a highlight. For more details on all the deals, check out the respective links.